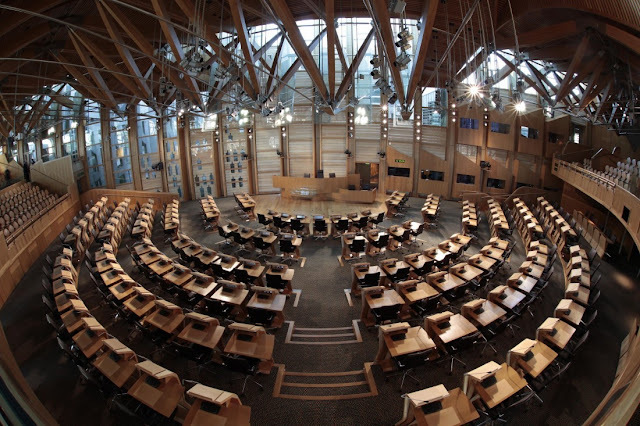 Yesterday, in the Scottish Parliament, facing a question about one of many examples where militarism and war are activity being promoted in schools the Cabinet Secretary for Education, John Swinney assembled one of the weakest responses I have ever heard in relation to a shocking ”dragon’s den style” lesson where children were roleplaying as arms dealers. The response simply was "teachers can determine the appropriateness of the material considered”. No condemnation, no disturbance and no investigation. According to Ross Greer MSP who pressed the minister on the issue, ”it’s very popular in South Lanarkshire, in the words of their head of education”. This is part of a long list of extremely questionable and alarming military related activities, along with other examples such as the armed forces targeting eleven-year-old first-year pupils in Kilmarnock, and a cadet commander tying a young girl’s hands on to a gun at a private school in Kelvinside. So far in Scotland alone compiled military data reveals 1783 visits to 377 Scottish education institutions over two years alone. Also, groups such as Forces Watch and the Quakers have been promoting petitions to the Scottish Government on guidance/Scrutiny of military cadet forces within schools. The pace the Scottish Government is moving on this issue is clear that they don’t want to rock the boat. Having a strong military presence within society as a whole negatively impacts the teaching of important of issues like free thinking or criticism of authority. “If you’ve got that in the school, are you going to be able to talk about non-military alternatives to conflict resolution, or promoting critical awareness around all the effects of warfare?” according to Ben Griffin, a veteran of the Iraq war and co-ordinator of the campaign group, Veterans for Peace UK. I don’t deny some people who are in the army feel it’s a great career, but for the majority of people it’s a different story. 56% of soldiers say they are dissatisfied or neutral with the job overall, 66% of soldiers are dissatisfied or neutral with pay and 45% of soldiers felt they were not offered proper opportunities while in the armed forces. As a secondary school student myself I can speak from personal experience. Seeing army recruitment events, there is often literally nothing at all about risks or dangers of joining - such as physical injury, death, bullying and mental health problems, which schools like to appear so keen to tackle, but when the military get in the way it’s as if the issue fades into irrelevance. It angers me to see fellow pupils with bright futures ahead of them drip fed a glamorised story of heroism. No young person deserves to have their life robbed by a dream built on the falsehoods of jingoism – they deserve the truth and the Scottish Government are failing to give pupils the clarity they need. It’s time we banned all military activity within our schools. I urge you to join Scotland Against Militarism in actively opposing the continued militarisation of our society.